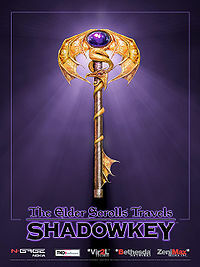 Narrative – Brief description of the Shadowkey storyline. Quests – All the quests upon which you can embark. Map – Scanned version of the map that comes with the game. Map Schematic – Simplified version of the in-game map. People – Listing of all the named people in the game. Places – Listing of all the places found in Shadowkey. Attributes – What are your basic stats? Classes – Information about the advantages gained through playing a particular class. Creatures – A bestiary of all the creatures found in the game. Items – Listing of all the items in the game and what they do. Multiplayer - Information on the two-player co-op mode featured in the game. Races – An Argonian in the ice of the north? It can be done. Spells – Listing of all the spells in the game, their effects and where to find them. Concept Art — Archive of concept art released for the game. Cheats — Less honest way of getting what you need. Music — Information on Shadowkey's soundtrack. Esta página foi modificada pela última vez à(s) 17h06min de 17 de outubro de 2014.